Watch Hop-Syn XT and swissQprint in action! There’s nothing like seeing printing in action. 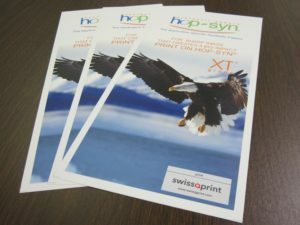 In this video, watch as the Hop-Syn XT synthetic paper is printed on the swissQprint wide format printer. Request free samples of this print run! For more information or to request free samples of the Hop-Syn and swissQprint campaign, contact a Hop-Syn sales associate at 800.524.0757 or fill out the online form. Hop-Syn XT synthetic paper is the most adaptable grade for brand owners and their print partners. Whether it’s used for indoor or outdoor applications, the Hop-Syn XT synthetic paper creates a big impact. XT is designed with extra tear-strength and waterproof properties to allow print promotions to meet the most demanding environmental conditions. Hop-Syn XT is UV-resistant for up to 1 year, and is ideal for POP displays, signs, banners, shelf talkers, and more. The XT grade is printable by all process including conventional offset, UV inkjet, flexo, thermal, LED and screen.